A Fusion Summon of this card can only be done with the above Fusion Materials. This card can make a second attack during each Battle Phase. Cyber Twin Dragon has more support to help bring it to the field nowadays. Second attack is always a nice addition to a large monster, and when combining it with Power Bond or Limiter Removal it can be pretty deadly to your opponent. This card is better now because of all the monsters that are “Cyber Dragon” that can be used to Fusion Summon this card. There are six other cards than the original Cyber Dragon that can become “Cyber Dragon” in various places, so getting two shouldn’t be very hard anymore. On top of that, the search support to get to those pieces has grown by leaps and bounds. Cyber Dragon is an archetype that has become legitimate over the years. Zane would be proud. Throwback to Cyber Twin Dragon. It is (They are?) a Level 8 Light Machine-type Fusion Monster with 2800 Atk and 2100 Def. You need two Cyber Dragons and no substitutes to properly Fusion Summon this great double attacking beat stick. More and more monsters are Cyber Dragon these days. Super Polymerization is legal again which would make a mirror match very fun. Power Bond is nice and legal to give you a 5600 Atk double attacking beat stick. Limiter Removal can make things get ridiculous. My only complaint is my complaint with most Fusion Monsters. It doesn’t just gain the attack of 2 Cyber Dragons. It also can’t be used to make Cyber End Dragon. Although 3 Cyber Dragon is easier than Cyber Twin plus Cyber Dragon, the lore would have made that cool. In any case, Cyber Twin Dragon is a great play to summon legitimately in Cyber Dragon decks, for Waking the Dragon players, and all the artworks are awesome. Throwback Thursday this week is dedicated to the Cyber Dragon archetype and since we looked Cyber Dragon Nova and Power Bond earlier this year when Cybernetic Horizon was new and we looked at Cyber End Dragon when the Legendary Dragon Decks were released, I thought we’d look at Cyber Twin Dragon this time. Cyber Twin Dragon is a Level 8 LIGHT Machine Fusion with 2800 ATK and 2100 DEF and specifically requires two Cyber Dragons as material. Stats are great on a Level 8, getting two Cyber Dragons isn’t hard since most of the monsters are treated as Cyber Dragon on the field and/or in the GY, LIGHT and Machine is good. 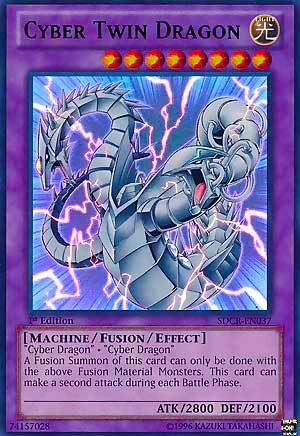 A Fusion Summon of this card must be done with the above Fusion Materials, so I guess no King of the Swamp or cards like that, but back in the day I know you summoned this off Metamorphosis from time to time and most of the monsters in the archetype are treated as Cyber Dragon specifically so that gets around you having to actually use two of the original Cyber Dragon. This card can make two attacks during each Battle Phase. This can get scary if you summoned this off Power Bond or use Limiter Removal, which is now at 2. A 5600 body that attacks twice is terrifying and imagine if you use both, then you got 11200 ATK attacking twice or 22400 ATK if you use two Limiter Removals, but that gets more and more farfetched and less common. If this had piercing, it’d be icing on the cake. Still a 2800 double attacker that can easily be a 5600 double attacker in some cases is great and is not hard to summon in Cyber Dragons, though being DARK would of been nice for Overload Fusion. I just sorta wish Cyber End Dragon could attack three times, but I guess since he got the piercing, than a 4000 ATK triple attacking piercer is way too overpowered. Art: 4.25/5 Two heads really are better than one. Ahh, I remember when Cyber Twin Dragon first came out in 2005, and we reviewed and reveled in it for its OTK abilities. Great Throwback Thursday choice here. There’s honestly probably not much you don’t know about Cyber Twin Dragon. Level 8, great attack for the Level at 2800, Light and Machine, and being able to attack twice in the same Battle Phase. Slap on a Limiter and Megamorph, attack twice, you have a OTK just like that, probably even a FTK if you got lucky enough. Power Bond (also a Throwback Thursday not long ago) works well with this as well. Not much else here folks, this Fusion has stood well enough over time, given how well Cybers can still be and all the support they and Machines continue to receive. Art: 4.5/5 I like Cyber End better, this is a little generic, and the vibe is very reminiscent of Twin Headed Thunder Dragon…still good though.